Part of the Animal Tales series, this book contains simple text and double-page illustrations in bold collage. The internal spreads really do speak for themselves and the flow of the text will keep the sturdy pages turning. 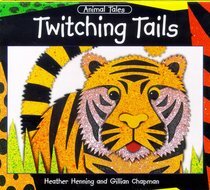 About "Twitching Tails (Animal Tales Series)"
Heather Henning has written several popular children's books including Esmeralda and the Night Creatures, Dandy the Donkey, Biffy to the Rescue, and more. She collaborated on titles such as God Sent a Baby King; When God Created the World; God Made a World; Silly Stories; The Adventures of Misty, Minty, and Mango; Who's My Friend?, and many others. With more than 44 books to her credit, she lives in the Northern Ireland countryside where she teaches speech and drama.